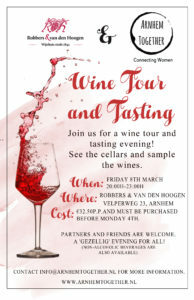 We listened to your requests, and many of them were wine related…so we have organized a Wine tour and tasting evening at Robbers & van den Hoogen, Arnhem on Friday, March 8th from 19.30. This evening is open to partners and friends, because sharing wine is a great social way to meet others! The evening includes a tour through the museum and the cellars, then a chance to taste 6 different wines and talk with others. Tickets are €32.50 And must be reserved in advance.